I have recently set up a bike with a dynamo hub for use in the Tour Aotearoa and while it's all fresh in my mind I will share the basics so you might find it easier than I did. There are many resources out there but a lot of them assume you know more than you do. A few disclaimers from the start. 1. Dynamo lights are not magic, and as far as I know, they only come with bike mounts, as opposed to helmet-mounts. You cannot ride singletrack fast with a bike mounted light alone. Optimally you would also have a helmet mounted light for seeing around corners. 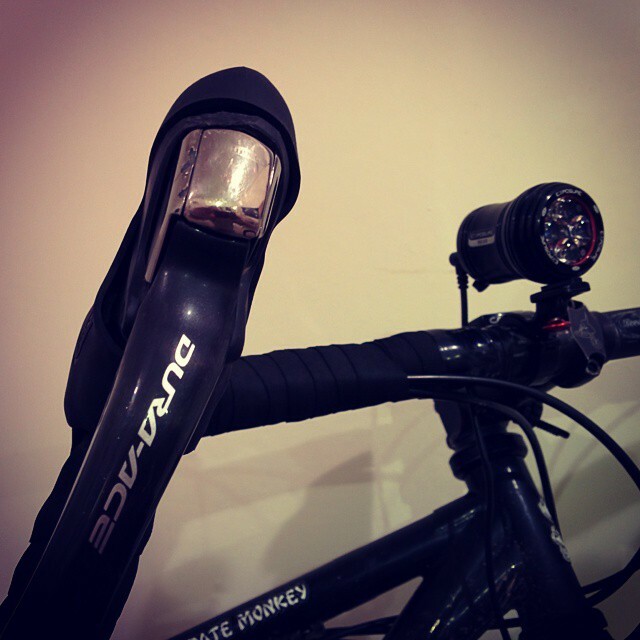 Obviously for commuting a bike mounted light is more than enough. This post is angled at a "bikepacking" end-use (although commuting is a no-brainer for dynamo lighting). 2. When the going gets slow, your dynamo light will put out a lot less light than you would expect from a typical battery powered light, depending on your set-up and how fast your "slow" is, this is why people will often run a spare light-weight helmet mounted light. Requirements: Dynamo, light, usb converter and a power-bank/battery (and a device to power). A fourth scenario is to have all of these things working with a switching system. Kerry at kLite builds these to order and probably knows more about dynamo lighting in relation to bikepacking than anyone out there. A switch means that you don't need to stop and unplug and replug devices. A smaller battery or capacitor built into or attached to the light so that the lighting does not disappear immediately you stop moving. Many dynamo lights have them built in. What is a USB converter? 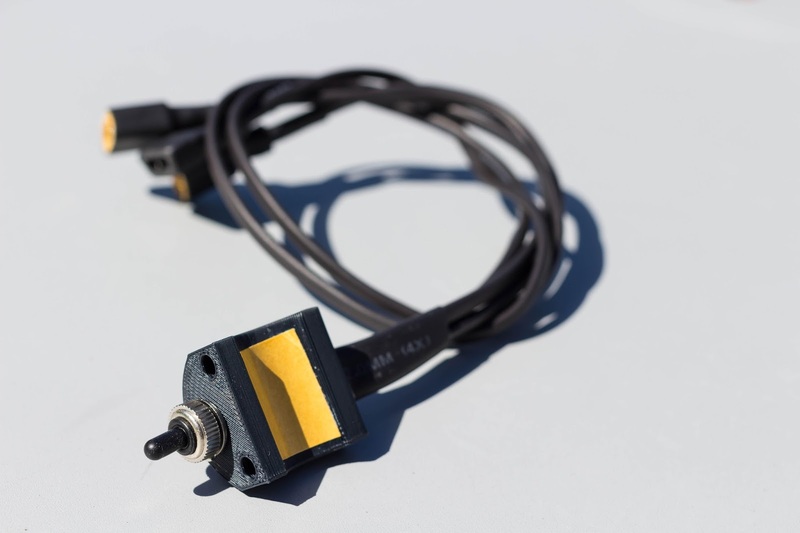 This device changes the current from the dynamo from AC to DC so that it can be used to charge devices like GPSes, smart phones, cameras or power-banks (batteries). A very popular device seems to be the Sinewave for bikepacking needs. Another popular choice is the Ewerks. A well researched list of hub-dynamo USB converters is available here. What is a cache battery? It's just a battery/power-bank you run inline, after your usb-converter but before the device you are powering. Eg.If your GPS sends up a nag screen saying "lost power" because you are riding slowly up a steep hill and not generating enough power, the cache battery, (if it has some charge in it) will supplement the GPS and stop the nag screen. 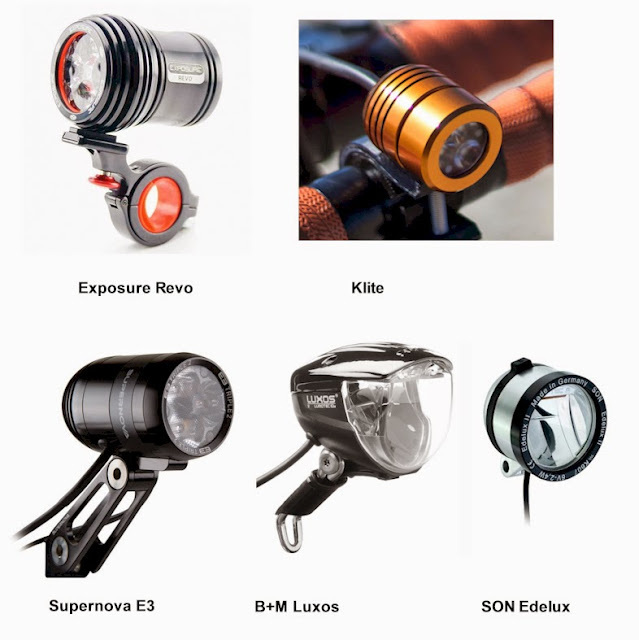 The rich kids will use an Exposure Diablo or Joystick head-light as it serves double duty as cache battery/power bank as well as its original use as a helmet light, should you get into some gnarly trail late at night. When looking for a cache battery/power bank its helpful to have one with "pass-through charging". This means you can charge the battery and use it to power other devices at the same time. 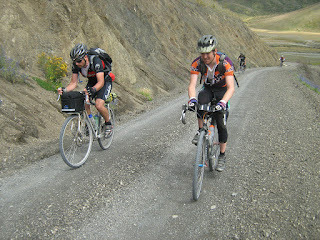 Rob Davidson used a Plox branded one in his Tour Divide. Some connection scenarios rendered in an "ascii diagram"
Obviously some set-ups might let you charge or power, and use the light at the same time but its unlikely you are going to be making enough power to do both equally well, but it depends on the load. If you read Kerry at kLites info page you will learn that some devices are more power hungry than others. Cell phones vs GPS for instance. You may still be able to use your lights and power your low-drain GPS. I'm not sure how useful the bottom two are but the top two are very robust and proven in Bikepacking circles. 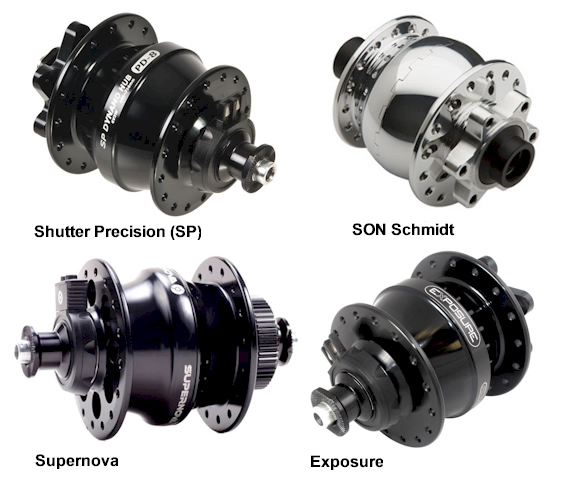 The best dynamo hubs seem to be the following. Some are just licensed versions of another. It's my understanding that the Supernova and Exposure are licensed versions of the Shutter Precision (SP) hub. The SP hub is not user serviceable but can be overhauled for a reasonable fee after sending back to the factory. The SON hub is user serviceable, if you are keen. SP claim their system is more simple hence robust and therefore is not high maintenance. SON has been around for a long time and many people will say they have had no problems despite commuting 50kms a day through a monsoon for 5 years solid! The SON can cost twice what the SP hub costs but it is worth shopping around for prices. The Exposure Revo hub/light kits are amazing value if you can get one, as the Exposure parts, (lights) are incredibly expensive bought separately. The best Dynamo lighting resources I have found are from Kerry at kLite, (in Australia) and the Peter White Cycles sites (US). Here are a few more real life cases where people are using dynamo lighting systems in Bikepacking situations. More to come as I discover it! I've just got my Klite setup done today. Awesome light and yes, charging both the light and the cache will mean a very low beam. Lots to learn yet though. Keen to hear how you go. I have had an SP hub go faulty. On night two of kiwi brevet. Just got back to the seller before 2 years were up and they are now sending a replacement. It's the 15mm thru axle compatible one which can be used in 9mm dropouts with 5mm quick release also. IDC via ebay sold it to me. They are listed as a seller on the SP site. I know two other guys have had the SP hub go bad on them. This is a bit of a small sample size I have and seems unlucky. It's good the warrantee is being upheld fully.